تحويل و عرض آمن و بجوده عاليه لملفات الـ PDF لتسهيل توزيع الوثائق ، و تبادل وجمع البيانات. من طرف أي شخص . Adobe Acrobat X Pro software lets you deliver professional PDF communications. increase the accuracy of data collection while reducing the costs of manual data entry. • PDF file conversion. Create PDF ********s from any application that prints, including one-button conversion from Microsoft Word, Excel, PowerPoint, Outlook, Publisher, and Access, as well as Firefox and Lotus Notes — without ever leaving your authoring application. • HTML to PDF. With a single click from within Internet Explorer or Firefox, capture *** pages as PDF files, keeping all links intact. Convert only a portion of the page by selecting just the ******* you want. • Email to PDF. Handle email-****d communication more efficiently and simplify email search and retrieval. Archive emails or email folders from Microsoft Outlook or IBM Lotus Notes with one-button ease. Easily edit PDF files and quickly export PDFs to Word or Excel ********s. Spend less time re***ing information and more time reusing *******. Use Acrobat X to reduce errors, improve productivity, and finish projects faster. • PDF to Word. Save PDF files as Word ********s with improved preservation of formatting and layouts. Relative positioning of tables, images, and even multicolumn **** is preserved, as well as page, paragraph, and font attributes. • PDF to Excel. Expedite reuse of ******* by converting PDF ******** data to Excel file formats. Even select a portion of a PDF page and export it to an editable format. • Editing PDF files. Quickly and easily edit PDF ********s without going back to the original source files. Save time by making simple changes to **** and images directly within PDF files. Remove, reorder, and rotate PDF pages. • Printing preparation. Reduce errors and delays at the printer. Preview, preflight, correct, and prepare PDF files for high-end print production and digital publishing. No need to fill people's inboxes with multiple emails and attachments. Create and deliver professional-looking PDF files that are simple to send, open, view, and navigate. • PDF Portfolio assembly. Quickly assemble a wide range of file types — including audio, video, and rich media ******* — into a polished, organized PDF Portfolio using the new PDF Portfolio Wizard. • PDF Portfolio customization. Easily customize PDF Portfolios with included layouts, visual themes, and color palettes. Add corporate logos and colors to reflect your branding. Import custom PDF Portfolio layouts and themes developed by third-party developers and designers. • Rich media. Quickly bring ideas to life through rich, interactive ********s. Insert audio, Flash Player compatible video, and interactive media into PDF files, for seamless playback in Adobe Reader X or Reader 9. • Attaching native files. Make sure source files are simple to locate, access, and archive. Attach them to any PDF ******** in their original, native formats, ensuring a more complete ******** of record. كنسخة تجريبية يتابع الطريقة الثانية و هي الأسهل و المجربة شخصيا . 1. نقطع الإتصال بشبكة الأنترنيت . من ال**** المرفق ( لا تغلق ال****!). لتفعيل البرنامج بوضع منقطع على الإتصال_ activate offline . 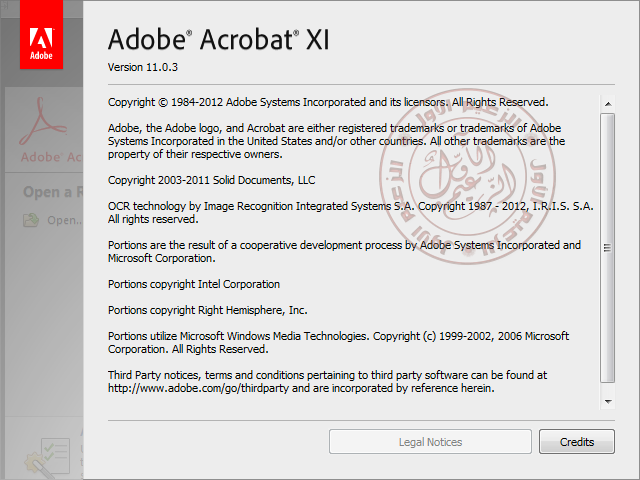 برنامج Adobe Acrobat XI و الضغط على Generate . نجد ملف الهوست على المسار التالي . 7. إفتح البرنامج و تمتع به كاملا ، بالتوفيق إن شاء الله .